The study asked local councils across the UK to provide details of nuisance noise complaints received over the last three years. Data was received from 308 local councils, including both Portsmouth and Southampton. Kensington and Chelsea was revealed as the noisiest authority area in the country, with 87.55 complaints per 1000 people. Southampton reported 13.86 noise complaints per 1000 people, while Portsmouth reported only 10.2 per 1000 residents. 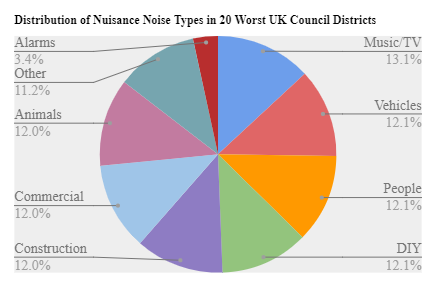 Although The News reported on this story back in April, naming and shaming Portsmouth as ‘one of the worst UK cities for nuisance noise complaints’, this is only true if London and Northern Ireland (NI) are excluded from the data. If London and NI are included, Portsmouth does not make it to the country’s top 20 for noise complaints. Southampton is the 14th noisiest city in the UK, with Portsmouth at 28th. When the NI and London data is excluded, Portsmouth is 14th on the list of cities with the most complaints for nuisance noise, while neighbouring Southampton comes in 5th. Some of the quietest authority areas in the UK are rural. The areas with the lowest nuisance noise complaint rates in 2016 included Dumfries and Galloway in Scotland, Derbyshire Dales in England, and the Western Isles in Scotland. Six out of ten of the areas with the lowest nuisance noise complaint rates were in Scotland. Across the water, the Isle of Wight weighed in at only 3.37 complaints per 1000 people. Image by Love My Vouchers. The main causes of noise disturbance (see pie chart, right) in the study were music and TV, accounting for 13.1% of all reports, closely followed by vehicles, people, and DIY at 12.1% each. Complaints about noise from animals make up around 12% of all complaints. Some of the most peculiar noise complaints received by local authorities included a group of men playing indoors football in Brent, someone “jumping up and down on ceiling for 6 months” in Leatherhead, and complaints about Morris dancers in Surrey. The Council reports around 2,500 noise complaints are received each year, with the majority relating to complaints about noise from neighbours. Such complaints often occur outside normal working hours, defined as between 6pm and 2am Monday – Saturday, and 6.30pm and 1.30am on Sundays. The local authority only deals with complaints relating to residential, industrial and commercial noise complaints. Disturbance created in public places, including in streets or shopping areas must be taken up with the police. For most domestic complaints, the Council encourage people to use Portsmouth Mediation Service, which aims to resolve complaints without formal action and aims to be the first point of contact for people engaged in noise disputes with neighbours. Although each year a significant number of notices served for nuisance noise complaints across the UK, prosecutions appear to be rare, with an estimated 0.14% of cases resulting in fines and convictions, including Anti Social Behaviour Orders (ASBOs) or Criminal Behaviour Orders (CBOs). Residents wishing to make a complaint about nuisance noise can do so online at the Council’s website.